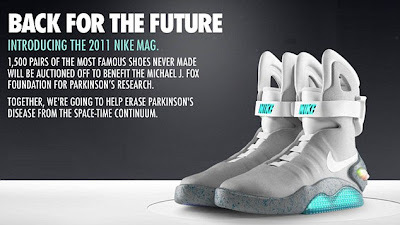 Last week news broke across the world that the futuristic Nike Mags trainers from Back to the Future II had actually finally been made (I posted a while back about the patent being picked up by Nike in 2009), and it turns out they have. 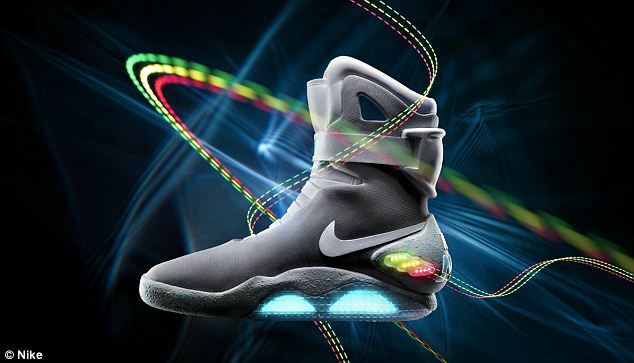 But there are a few problems for people wanting to pick up a pair. 1) You can't, or at least shouldn't, wear them... They're for display only. 2) A limited quantity will be available (at least initially) of 1500 which will be auctioned off for Michael J Fox's Parkinson's charity. 4) They are only available in the US, the auction doesn't allow for shipping to other countries (you'd have to win the auction first! The first pair went to Tinie Tempah for $37,000!!!). So basically it's a "YAY" for them being made and a big "BOOOOOOO" for teasing us but not being able to supply us!